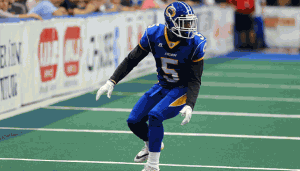 As they enter the 25th year of existence, the Tampa Bay Storm are looking for a bounce back season in 2016. They took the first step towards that goal by resigning standout defensive back James Harrell. Not only does Harrell represent a major cog in the Storm’s defensive backfield, but he is also home grown. Harrell played high school football just a few miles away from Amalie Arena at Plant high school and now he will continue to fly the flag for Tampa Bay as a member of the Storm. Harrell proved last season to be a tone setter for the success of the Storm defense. When he was holding receivers at bay, the defense were able to hold offenses out of the endzone. In fact, Harrell made an impact play in all but one of the Storm’s seven wins last season. As a sure tackler and lock down defender, Harrell play an important role in the great defensive efforts produced by the storm. There were those that believed that Harrell’s performance, which earned him Second Team All-Arena honors, might see him snatched up by an NFL team and invited to training camp. At 5’10” 195 pounds, he possesses good size to play the position and the one thing experience in the AFL affords any defensive back, is playing in pass coverage. With the NFL so hungry for defensive back talent, combined with Harrell’s age (26), and athletic pedigree (his father James Sr. played nine professional seasons in the NFL and USFL at linebacker) it was surprising that he was not signed by an NFL organization. The Storm’s re-signing of Harrell, and a few other key additions defensively, will hopefully help that side to play more consistently. There were times last season where the defense would lock opponents down and other times where it seemed as if they ushered their competition into the endzone. The defense will have to become more consistent as a unit to have more sustained success in 2016. Now a lot of that responsibility will fall on Harrell to lead the way. The NFL’s loss is the Storm’s gain because at his age, Harrell is coming into the prime of his career and the Bay Area will be on hand to experience it with him. His continued improvement and stellar play will be instrumental in returning the Storm to the level the Tampa Bay area has become accustomed to seeing over the previous two and a half decades. The Silver Anniversary for the Storm must be a resurgence and Harrell will no doubt play a major role in it.